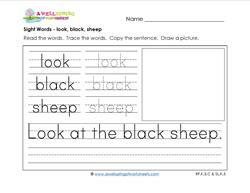 These sight words worksheets use three sight words to make a sentence. Children read and trace the sight words. Next, they read the sentence and rewrite it on the line in their very best printing. Lastly, they draw and color a picture that goes with the sentence. A practical example of how words are put together to make sentences. You can point out the capital letter at the beginning of each sentence and ending punctuation. Go to this page to see more kindergarten sight word worksheets. Trace the sight words - am, on, chair. Read and write the sentence: I am on the chair. Draw a picture of yourself sitting, singing, or even dancing on a chair! We are at school. I wanna be at school! School is cool! Trace the sight words - are, at, school . Write the sentence. Draw yourself at school. I ate three red apples. 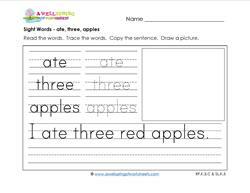 The three featured sight words - ate, three, apples. Trace, write, and draw. Will you draw three apples or the leftover cores?Yum! Is it a truck, a van, or a big, fast race car? The big car is red. 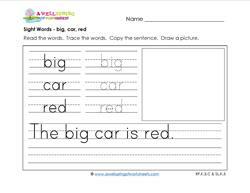 This sentence combines the sight words big, car, and red to appeal to little imaginations. Kids love to play with their friends. Putting together the sight words - came, play, now - gives us this sentence: He came to play now. What fun is in store? I can jump up. But the question is how high can you jump? 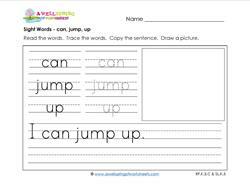 The sight words - can, jump, up - fill your thoughts with kids like Tigger! Trace, write, & draw. Trace the sight words - cat, ran, away. Write the sentence in your best printing. The cat ran away! Draw a picture. What is the cat running away from? Kids love to go to each others homes to play! Trace the sight words - come, my, house. Write this sentence: Come to my house! Draw a picture. Can you hear the ball bouncing? I have a blue ball. Trace the sight words - have, blue, ball. Write the sentence and draw a picture. Bounce! Bounce! I like this new flower. What's not to like about a newly bloomed flower? Trace the sight words - like, this, flower - and write the sentence. Draw a picture. Baa. Baa. Look at the black sheep. Have you any wool? Trace the sight words. Write the sentence and draw a picture. Yes, sir I will! The sight words - make, a, cake - mix together to bake the sentence: Please make a cake. Trace the words. Write the sentence. Draw a picture. 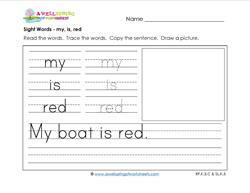 Sail away with this sentence: My boat is red. Trace the sight words - my, is, red. Draw a picture of a red boat (with you in it!) and write the sentence. Think Charlotte's Web when you read the sentence: My new pig is here! Trace the sight words - new, pig, here. Write the sentence. Draw a picture. No frowny faces as you write the sentence: Please find my doll. Trace the sight words - please, find, doll. Draw a picture of your found doll safe with you. I saw four blue fish. This sentence uses the three sight words - saw, four, fish. Trace the sight words. Write the sentence. Draw a picture of fishies in the sea. The sight words - see, little, bird - have flown in for this sentence: See my little bird? Chirp! Chirp! Trace the words. Draw a picture of a fine feathered friend. Can you see kids laughing and smiling? The sight words - she, funny, girl - are used in the sentence: She is a funny girl. Draw a picture of a funny girl. Little girls are especially pretty. The sentence for this worksheet is: That girl is pretty. Trace the sight words - that, girl, pretty. Draw a picture of a beauty. Man's best friend times 2. Ruff! Ruff! The sentence in this worksheet: Two dogs run and jump. 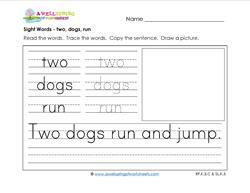 The sight words - two, dogs, run. Trace, write, and draw. We see a brown nest. Can you see kinders in awe of such a discovery! 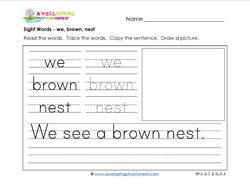 The sight words - we, brown, nest - make up the featured sentence. Draw a picture! The sight words - where, the, farmer - make you wonder where, o where can he be? Write the sentence. Draw a picture. Grab your cowboy hat & saddle up: I will ride a horse. 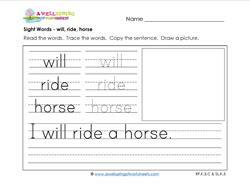 The sight words - will, ride, horse - hint at havin' fun times. Giddyup! Draw yourself on a horse. The yellow corn is good. Especially with butter! 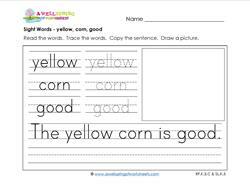 Trace the sight words - yellow, corn, good. Draw a picture and let's eat!